“Customers will have to pay more in their energy bills as Ireland moves away from fossil fuels in the coming years”. According to the "White Paper" on Energy published today, Ireland will be using no fossil fuels by the end of the century. (I would imagine that plan might be helped by the fact that most of the fossil fuels will be used up by then). 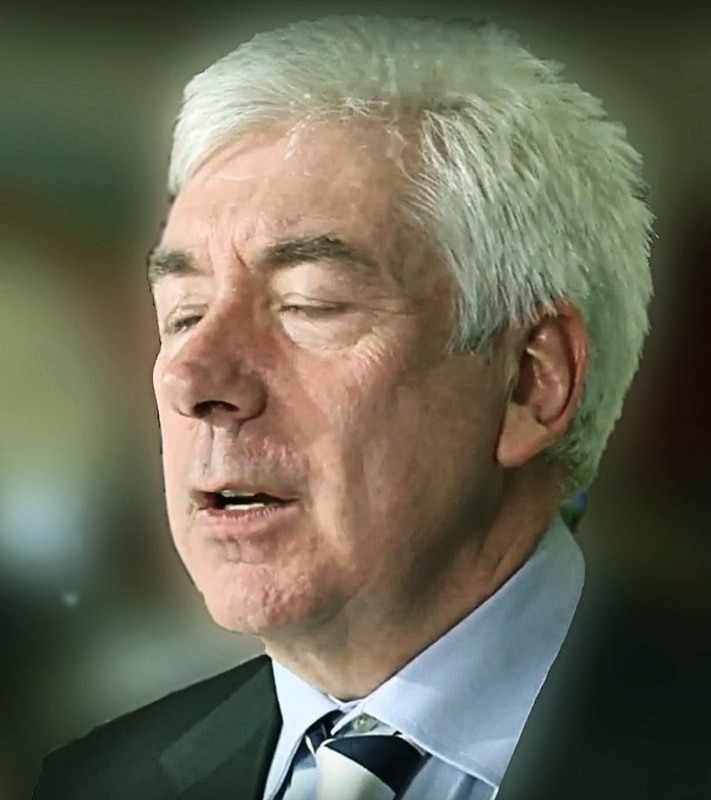 The Irish "White Paper"outlines aspirations for long-term energy goals and proposed strategies for Ireland. Mr White also said in his statement that Ireland was still dependent on fossil fuels to the extent of 92 per cent. The paper proposed over 90 lines of action. Among the big and bold proposals there are references to “improved domestic grant schemes and financing options for energy efficiency upgrades” and “a new support scheme for the development of renewable energy technologies”. My focus and concern is with the impact these Clean - Green - and Carbon Reducing Policies will take on the less well off. Simply adding taxes to dissuade the use of coal etc. is only going to add to fuel poverty in Ireland, and will ultimately fail as people will find ways to get cheap fuel. What about 0% Disposable Income Families and Energy Costs? I sincerely hope that the discussion and planning fully considers how carbon taxes and energy costs impinge on the less well off. "You cannot get blood from a turnip" and low income families cannot just go out and buy expensive heating systems - taking advantage of grants etc. There needs to be a LOW-TECH and LOW-COST strategy applied in addition to the high flying ones. I hope also that any grant schemes would consider the real carbon value of the investment. The huge State grants schemes, of recent years, given for geothermal heating systems and wood-pellet systems, I am fairly sure, did not factor-in the carbon costs in terms of the heavy reliance on non-green electricity, or indeed failed to properly calculate the carbon costs of the machinery itself and its regular servicing and replacement. Would the Minister consider the following? 1. A Scheme to eliminate all open fires and replace them with Stoves? I hope that low-tech and low-cost green solutions might come into the focus for the planners. Solutions like encouraging the installation of simple and very inexpensive stoves to replace open fires would be one very important investment which would offer HUGE long-term pay back, and very low maintenance costs. (a) A large reduction in fuel usage for home heating. (b) A reduction in heat loss caused by the excessive airflow of an open chimney. (c) An additional financial and social advantage of such a scheme is that it would substantially reduce fires and fire related accidents in the home, saving lives, suffering and money. 2. 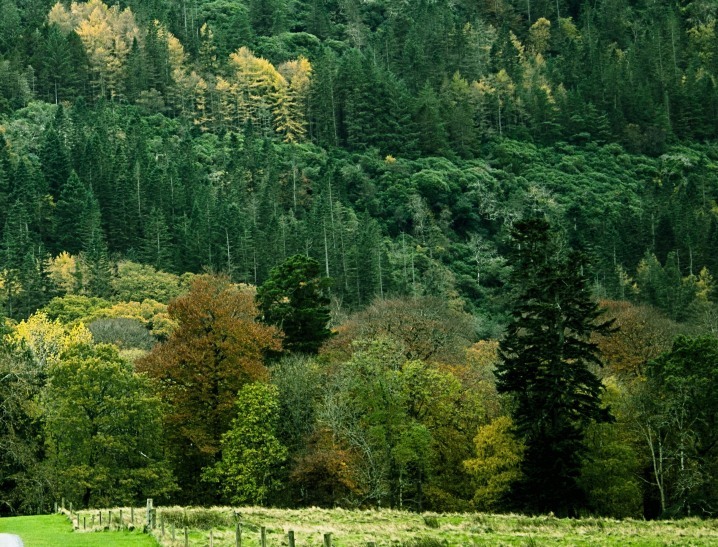 A Massive up-scaling of timber production in Ireland? Another long-term and perhaps initially costly investment would be in a massive up-scaling of forestry in fast growing timber to feed a wood-based solid fuel industry to replace coal in domestic heating. We are talking National Security here, so costs should reflect the importance. Sally tree plantations would provide quality wood suitable for bio-mass use in a very short space of time and can be cropped repeatedly for several years before replanting is necessary. In 2012 Ireland imported 2.4 Million Short Tonnes of coal. If we assume, (I do not have actual delivered price per tonne), a cost per tonne including shipping and transport of say just €100 - that would give us a figure of roughly €240 Million Euro leaving the country every year for coal. (5) provide many more jobs in that industry. 3. 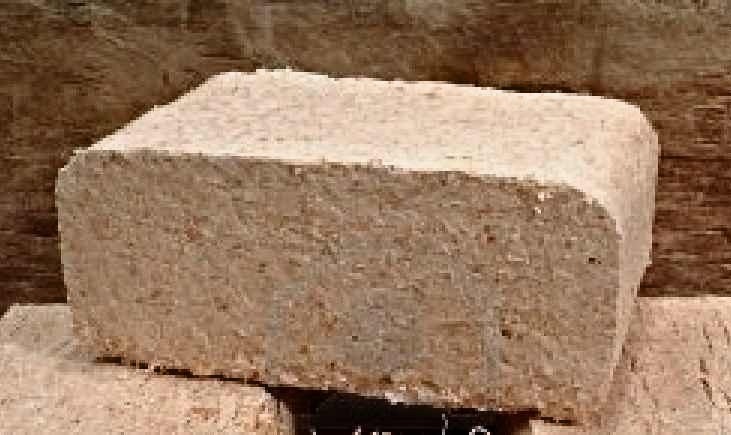 Investment in Super-Hard Fused Wood Briquette Production. The proposed type of wood briquette / log differs widely from the types generally available in Ireland at the present time. There are currently 3 types being sold. Non of which are good substitutes for coal products in stoves etc. Below are 3 less satisfactory types of wood briquette. 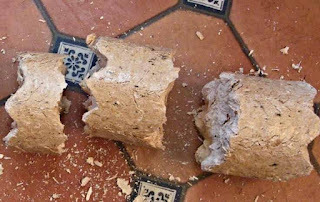 The top two, of the above 3 photos, show briquettes, which are essentially compressed sawdust are the least desirable, as they expand up to twice their size in the fire. Expansion of fuel in a stove etc. can present Carbon Monoxide poisoning danger by restricting the flue. The burn pattern is also quite poor. They tend to fall apart in the fire. The bottom photo shows a slightly better type of wood briquette. This type is screw extrusion type and tends to hold its shape better. However, it burns much to quickly and is therefore not a good substitute for coal. While this type burns well, it is incapable of giving long duration burn and long duration of burn overnight is exactly what is needed when a stove is the primary source of heat in the home. Along with massively developing timber production, the Minister might also consider investment in a wood-fuel production industry to produce primarily super-hard fused wood logs / briquettes, but also wood pellets. 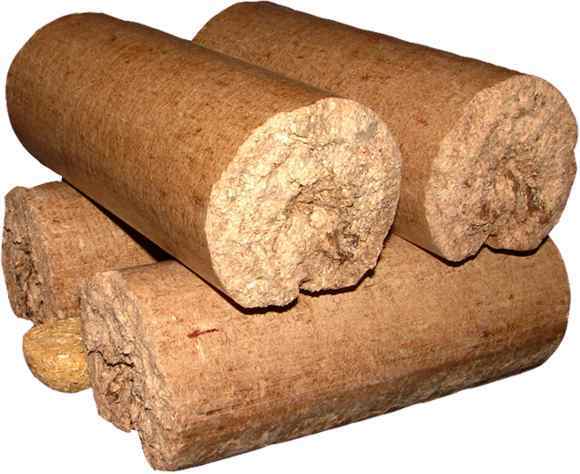 This type of briquette / log is not currently available in Ireland, as far as I am aware, let alone produced here. 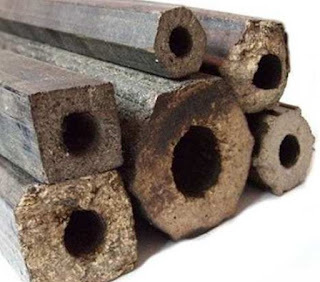 Contrary to general belief, this type of fused wood briquette can 100% successfully be produced from most soft woods, and from waste wood or sawdust. Fused wood briquettes are capable of fully replacing coal as a fuel for stoves and ranges. (3) It does not expand in a stove or fireplace unlike most other forms of wood briquette and is therefore much safer in use. (4) It is very easily stored and handled. (5) It has a lower creosote deposit, and lower particulate release to the atmosphere. (6) It is a 100% carbon neutral fuel. (7) Replacing coal with this type of home produced briquette would save many millions of Euro leaving the country each and every year sustainably in perpetuity. (8) An industry based on this type of fuel would create many long-term sustainable jobs in the country. This would also represent a fairly large investment for Ireland to make, but if one was to think about it again, it could spell no less than an investment in the National Security, future economic stability, and help to ensure a sustainable energy future for the country. Rich to Pay Heavier Court Fines?